All Nigerian ports are limited in draft and highly congested, limiting the imports and exports of the country. In order to be able to accommodate the future growth in traffic and vessels, new port capacity is required. Rent-A-Port was requested to perform a full market assessment and traffic study in order to determine the traffic potential of the new port. 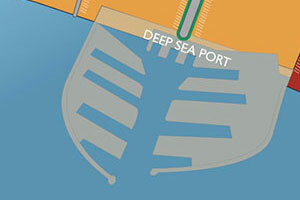 Based on the forecasted traffic, a masterplan for the new port was developed, with a step by step approach in order to allow an early start and limit the first investments. A full feasibility study was performed, analyzing the technical, environmental, operational and financial feasibility of the project. In order to determine the financial viability, Rent-A-Port did a full costing analysis from the construction, operations and revenue side.